Want to change the world? You have one vote. Use it wisely. Rox, Paper and The Scissors, touring Spring 2019 to theatres and schools! A fabulous, fun and sometimes silly show about Democracy for 9+ year olds. It throws up all sorts of stuff. 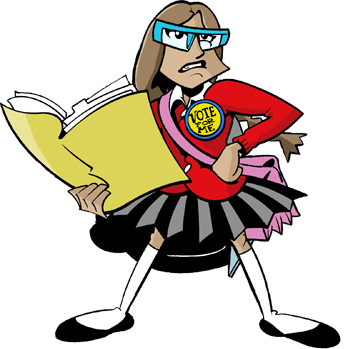 Come and see how we can bring PHSCE/British Values to life on stage and join us to watch three candidates – Rox, Paper and The Scissors – battle to become school president, only to find out the hard way that not all elections are fought fairly. As head girl Paper is squashed between the might of autocratic school bully Rox and reckless class clown The Scissors, she must fight to restore her reputation from a false accusation of vandalism, and stop malign forces from seizing power of the school council. Teachers’ resources will support the performance. School bookings (25 tickets+) will qualify for a free one-hour workshop on the Rule of Law. Online vote electoral forecasts: at the climax of the play, every member of the audience will be asked to vote in a secret ballot. Shadowing a real election, these votes will be counted as the tour progresses and electoral forecasts will be updated online until the final vote count is declared. Facebook resource page: @GttDProductions brings British Values to life by connecting the concepts to current news stories. Please email info@GttD.co.uk for more information.